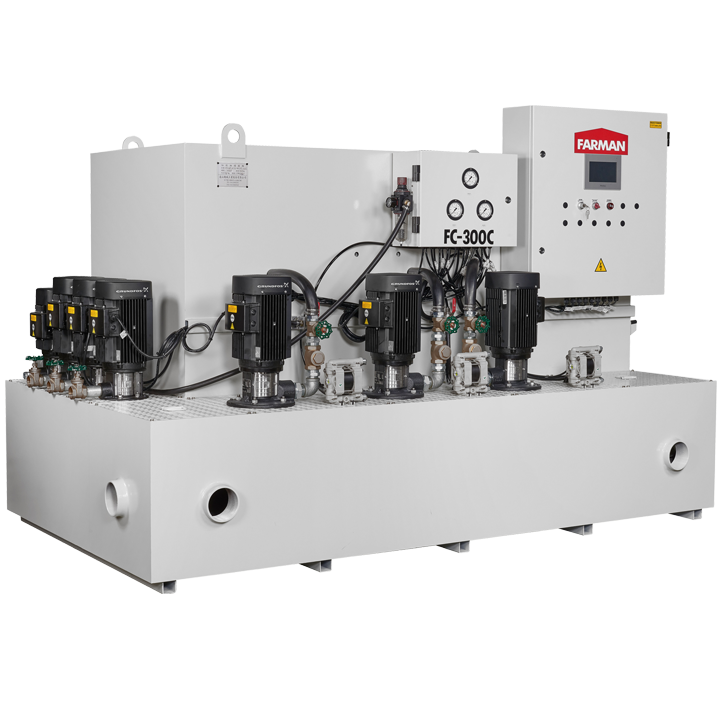 FC-300C is a 2200L cutting oil filtration equipment which can be coordinated with the grinder equipments prduced by various manufacturers to filter accurately large quantities of tungsten steel produced from grinding. On the one hand, the cutting fluid can be kept clean and constant temperature at all times; on the other hand, the grinding speed can be improved, and the loss rate of grinding wheel can be reduced. This full-range device coordinated with Grundfos pumps are the guarantee of long life and high quality. The type-C represents that the contents are three filter buckets with filtration capacity of 420L / min, and the three barrels are constituted by 61 filters in each barrel. When the oil sludge containing tungsten passes, it can be indeed filtered with the precision up to 1. In addition, it can be coordinated with three grinders with large flowrate or six grinders with small flowrate.